By Xah Lee. Date: 2016-04-01 . Last updated: 2019-03-12 . In 10 minutes, you'll have a basic understanding of HTTP protocol. Request/Response. Client makes a request to a server, server responds. Request/response format is just plain text, of two parts, header and payload (content), separeted by a empty line. First line of request message is called request line. It contains the “command”. First line of response message is called status line. It contains the “status code”. There are different “commands”, technically called “request methods” . Most useful are GET and POST. GET basically just ask for a resource (for example a file, or any data identified by a path.) POST means sending some data to server, such as needed by login or shopping chart. Each response has a status code. To understand HTTP protocol, we just need to understand the HTTP messages that the client/server send. 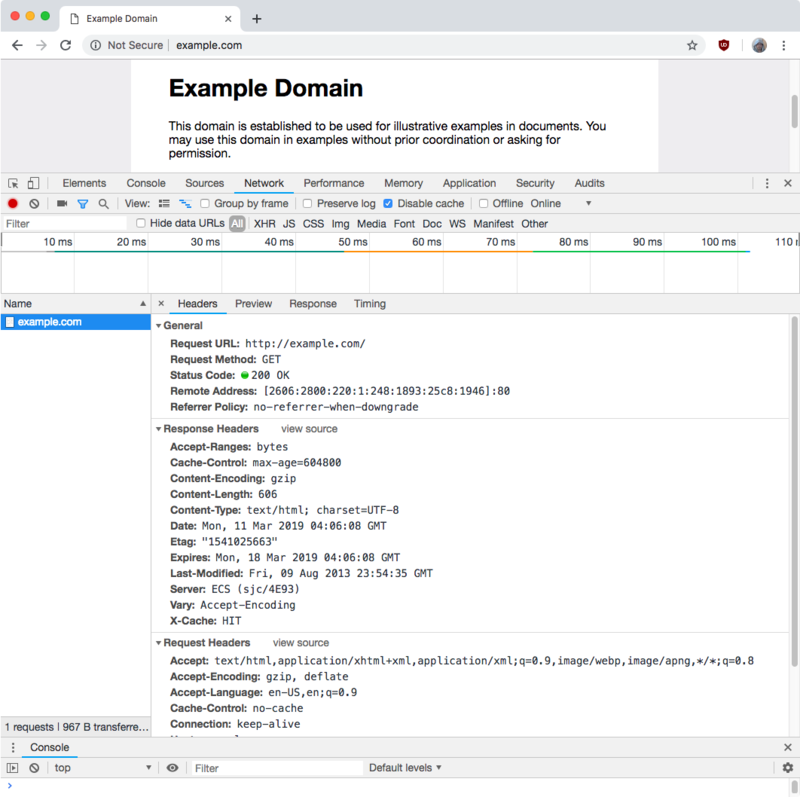 Let's first look at tools to view HTTP messages. 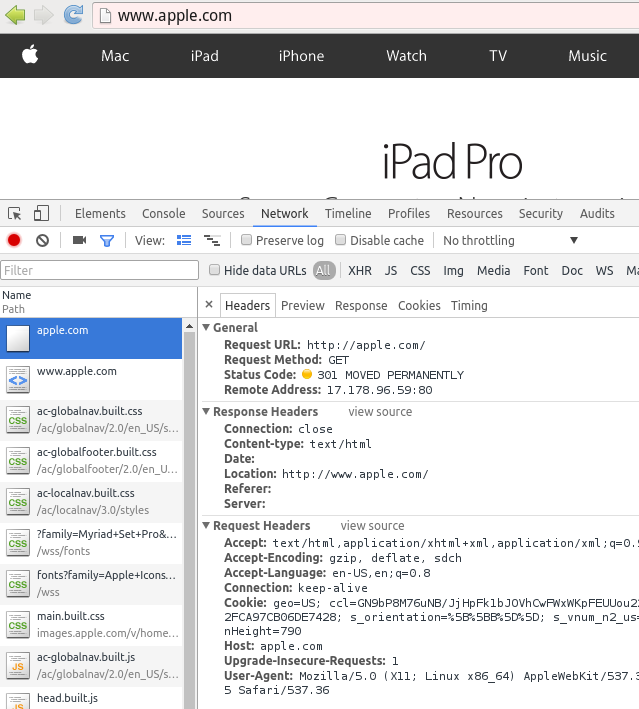 you can use web browser to view the header sent/received by client/server. Google Chrome browser showing HTTP message headers. Visit some page, type a URL in the URL box and press Enter. The following command line tools can view HTTP response header. Connecting to example.com (example.com)|2606:2800:220:1:248:1893:25c8:1946|:80... connected. Other languages, such as Python and Ruby, have similar tools or libraries. The message exchanged by client/server is plain text. It has 2 parts, header and content. Header and content are separated by 1 blank line. The first line of the header is special. The rest of header part is made of lines, each line is called a “field”. A field is separated by first colon : into two parts: field-name and field-value. It has 3 parts: ① request method. ② resource path. ③ http version. GET → request a resource. HEAD → Same as GET, but only get headers, no content. That is, just request metadata. Useful for web crawler, proxy server, etc. Other methods are much less used , and may not be implemented by server. GET → requests a representation of the specified resource. Requests using GET should only retrieve data and should have no other effect. (This is also true of some other HTTP methods.) The W3C has published guidance principles on this distinction, saying, “Web application design should be informed by the above principles, but also by the relevant limitations.” See safe methods below. HEAD → asks for a response identical to that of a GET request, but without the response body. This is useful for retrieving meta-information written in response headers, without having to transport the entire content. POST → requests that the server accept the entity enclosed in the request as a new subordinate of the web resource identified by the URI. The data POSTed might be, for example, an annotation for existing resources; a message for a bulletin board, newsgroup, mailing list, or comment thread; a block of data that is the result of submitting a web form to a data-handling process; or an item to add to a database. PUT → requests that the enclosed entity be stored under the supplied URI. If the URI refers to an already existing resource, it is modified; if the URI does not point to an existing resource, then the server can create the resource with that URI. DELETE → deletes the specified resource. TRACE → echoes the received request so that a client can see what (if any) changes or additions have been made by intermediate servers. OPTIONS → returns the HTTP methods that the server supports for the specified URL. This can be used to check the functionality of a web server by requesting ‘*’ instead of a specific resource. CONNECT → converts the request connection to a transparent TCP/IP tunnel, usually to facilitate SSL-encrypted communication (HTTPS) through an unencrypted HTTP proxy. See HTTP CONNECT method. PATCH → The PATCH method applies partial modifications to a resource. It has 3 parts: ① the HTTP version. ② the status code. ③ Human readable representation of the status code. Here's a full list. Those with a 🌟 sign are most frequently used. Cookies is also sent as part of the http header. Basically, when server responds, it can return a header such as Set-Cookie: name=value. When browser sees that, the browser is required to store it locally, along with which server the cookie came from. When browser makes a request to a server, browser must also send all cookies that the same server sent before. The purpose of cookies is for server to keep states of clients. For example, by setting a cookie, the server is able to know if the browser user is logged in. Here's a review about URL parts. It is not part of HTTP protocol, but is useful for web programers if you don't know it already. www.example.com → host. The “example.com” is domain name. “www” is sub-domain. x=1&y=2 → Called “query string”. It's a list of key/value pairs, used as argument for input. User can type it directly in URL, or it can be embedded in a link in HTML. The HTML form can specify method="post" instead. In that case, the URL won't have query string. The query string is in the body part of the HTTP message. The HTTP protocol is a high-level application layer protocol of the TCP/IP internet protocol suite. HTTP protocol is about client/server exchanging messages. But how exactly do browser find server across the globe? and How does browser send message exactly, by airplane? The details of how client/server communicate, is specified by many lower protocols in TCP/IP. For a basic introduction, see TCP/IP Tutorial for Beginner.